In the late nineteenth century the Catholic Church was increasingly worried about ‘leakage’ of people from faith and from the Church and we see evidence of this in Stafford. The issue of mixed marriages (in religious terms) was regarded as central to leakage, although the occurrence of mixed marriages in many ways reflected leakage rather than causing it. In 1888 the new Bishop of Birmingham, Stafford-born Edward Ilsley, demanded a return from parish priests on mixed marriages over the previous ten years. Canon Acton at St Austin’s reported that 58 out of a total of 108 marriages had been of mixed religion, of which 35 had been without dispensation. Although no people in these latter marriages had absolutely fallen away from the faith, he said ‘four attend Mass occasionally; the rest [are] negligent’. Of those with a dispensation the response to whether the Catholic partner had lost their faith was ‘none absolute[ly]; three practical[ly]; four fairly practical[ly]; the rest negligent’. Acton also commented ‘it may be useful to note that out of 12 known cases in which the non-Catholic was received into the Church for marriage, 8 have turned out unsatisfactorily’. His return did not distinguish Irish Catholics from the rest, but by the 1880s about 40% of Irish Catholic marriages were to non-Catholic partners. That proportion rose above half after 1895. St Austin’s Church, Stafford, designed by Edward Pugin and opened in 1862. Canon Acton’s pessimism about Catholics in mixed marriages extended to Stafford’s Catholics generally. In 1895 he was asked to make a return on his congregation, which had just lost the north end Catholics to the newly created mission of St Patrick’s. He claimed there were 510 in St Austin’s congregation but that ‘there are about 50 or 60 baptised Catholics besides who never come – e.g. 30 children of mixed marriages where the Catholic party never comes, who are practically Protestants’. Canon Acton reported that the number of Easter Communicants had been 275. If we add perhaps 50 infants to this total, this means about 64 per cent of the congregation had attended on that important day. Although Acton was worried about the abstention rate, in fact attendance had climbed steeply from its lowest point around 1851 when there had been mass Irish absence in the aftermath of the Famine. Church action over the succeeding forty years had succeeded in reclaiming significant numbers of the Irish and their descendants for the church. Many were, nevertheless, spasmodic or nominal Catholics and leakage through mixed marriages was increasing. The number of Irish and Irish-descended Catholics in Stafford was also falling by the late nineteenth century. 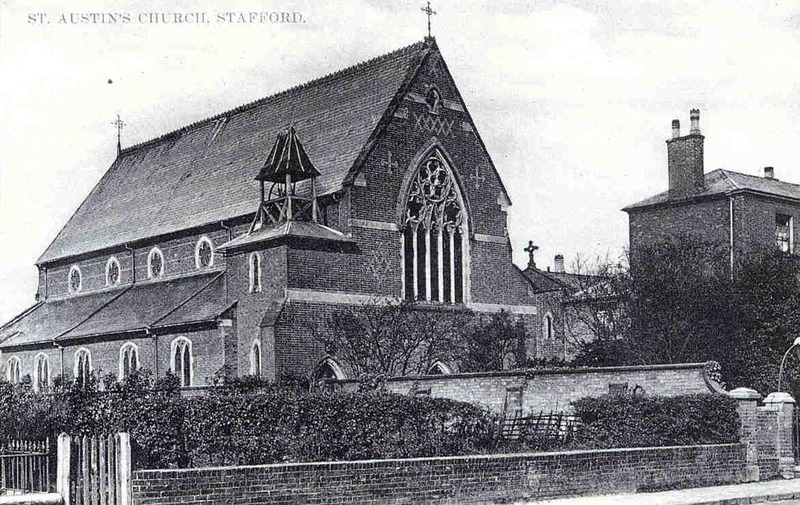 The total of Irish-born Catholics in Stafford had peaked at an estimated 554 in 1861 and numbers fell away thereafter because many Irish workers, particularly farm labourers, left the district in the late 1860s. Numbers continued to fall between 1871 and 1901 because of the departure and death of Famine-period immigrants. Such losses were only partly counter-balanced by new in-migrants because the Stafford economy, particularly the shoe trade, was faltering. Even so, the loss of Irish-born Catholics was counterbalanced to a great extent by increasing numbers of Irish-descended people, the numbers rising from 334 in 1861 to an estimated 520 by 1901. Their Increase did not, however, fully offset the loss of Irish-born, and the total of Irish born and descended Catholics declined from a peak of around 855 in 1861 to 631 in 1901. In simple terms, the Irish Catholics were a declining group in turn of the century Stafford. Evidence from baptisms suggests both a decline in the Irish Catholic presence in the Church and a change in its character. The number of baptisms overall was tending to fall because of the declining birth-rate, but the fall was steepest in the Irish part of the congregation. 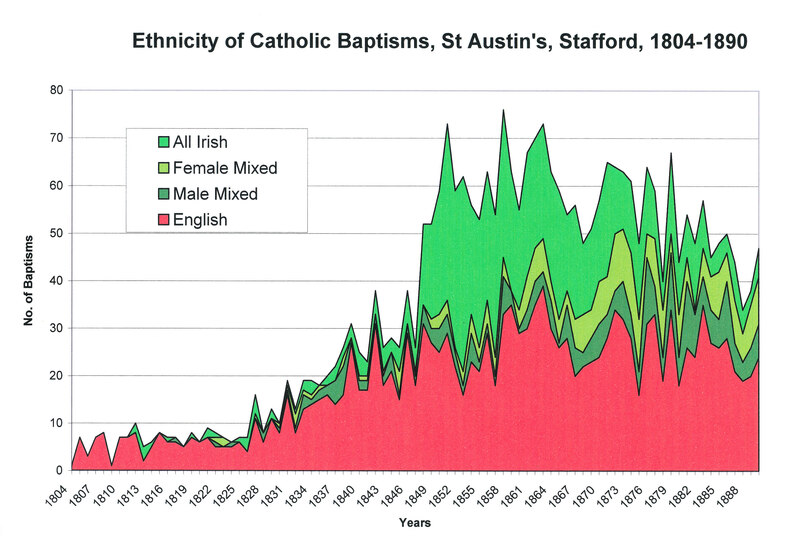 The graph shows how the proportion of ‘Irish’ baptisms of all types dropped from an average of 60% around 1860 to about 47% by 1890. The character of ‘Irish’ baptisms also changed radically. In the 1850s the vast majority had been to ‘all-Irish’ parents, but by the 1880s most were to the parents of ethnically-mixed marriages. This shows graphically the extent of intermarriage between the Irish, their descendants and native Staffordians. The number of ‘Irish’ baptisms declined more steeply than those of ‘all-English’ children. This was partly due to the falling Irish presence in Stafford but partly because the Irish birth-rate dropped disproportionately from the very high ‘rebound’ rate of the post-Famine decade. Nevertheless, the intriguing possibly remains that part of the decline of ‘Irish’ baptisms stemmed from very real leakage of the working class Irish and their descendants from the Church in the late-nineteenth century. These lost people were disproportionately of people in the north end of the town for whom the long and wearying walk to St Austin’s at the south end was too far. St Patrick’s Church, founded in the north end in 1893, was designed to tackle this problem. John Herson, ‘Irish migration and settlement in Victorian England: a small town perspective’ in R. Swift and S. Gilley (eds. ), The Irish in Britain, 1815-1939, (London, Pinter Press, 1989), pp. 84-103. This figure is almost certainly an underestimate since it is impossible to trace every descendant of Irish immigrants through subsequent changes of family name through intermarriage.